East Greenwich – Frances A. Congdon, 86, a resident of Greenwich Bay Manor and formerly of Brookside Drive, died Thursday, June 19, 2014 at the West View Health Care Center in West Warwick. She was the beloved wife of the late George R. Congdon, Jr. with whom she celebrated their 60th wedding anniversary on February 6, 2012 four months prior to his death on June 30, 2012. 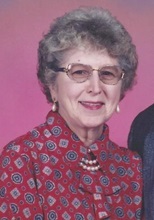 She was the mother of the late George R. Congdon III who died in 2005. Born in Dayton, OH, the daughter of the late Elton and Minnie Keyes, she was raised in Springfield, OH and graduated from Springfield High School. She worked as a secretary for Ohio Edison. After receiving “top secret clearance”, she worked as a secretary at Sandia Air Force Base, Albuquerque, NM the then principal nuclear weapons installation of the United States Department of Defense. For over 60 years she belonged to Adah Chapter #25, Order of the Eastern Star, serving as Worthy Matron in 1973-1974 & again in 1998-1999. Over the years she held numerous other Eastern Star offices. She belonged to the Archery Club and to East Greenwich United Methodist Church. Her funeral service will be held on Monday, June 23, 2014 at 10:00 AM at Carpenter-Jenks Funeral Home & Crematory, 659 East Greenwich Avenue, West Warwick. Calling hours Sunday 2:00 – 4:00 PM. Burial will be in Quidnessett Memorial Cemetery, North Kingstown. Donations in her memory may be made to Insight, 43 Jefferson Boulevard, Warwick, RI 02888-9961 or to the Susan G. Komen Breast Cancer Foundation, PO Box 650309, Dallas, TX 75265-0309.